Life has a way of making our priorities for us if we don't tell life what our priorities are. However, taking care of ourselves and our families should be the top priority. Prepping is one of those ways we take care of ourselves and our families. We need to make it a priority as much as possible. How you say? How can you make it a priority when you have to run your kids here, there, and everywhere? When the well-meaning committee chair calls and asks for your help? When you only have enough energy to make supper at the end of the day before you collapse? When your job is demanding more overtime and more time from you? Where is the time for prepping? The cold, hard truth about this is that you have to make time for prepping. However, this may be the easy part. Changing your thinking and your mindset might not be as easy. 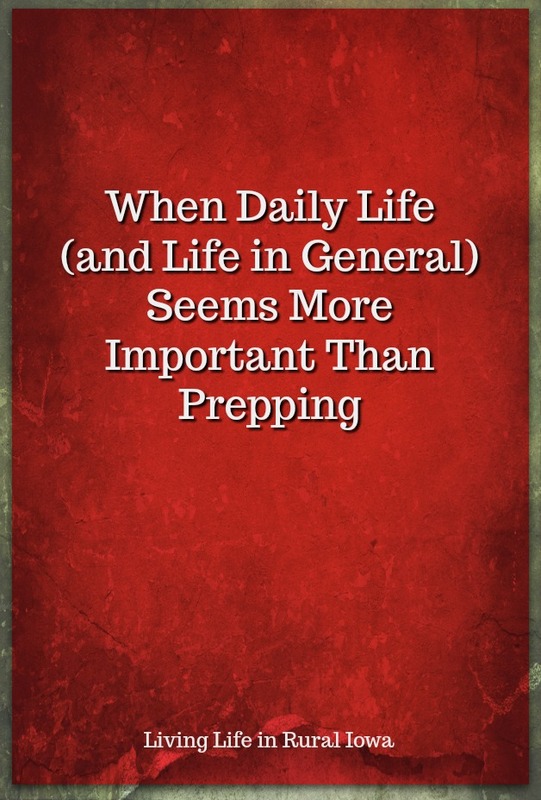 You can prep every day, multiple times a day if you want to. You can just make it part of your daily life. You can write a reminder in your planner. You can make a list of goals you want to accomplish and make it a priority in your week or month. You can make it simpler. Write down a list of supplies you want to stock up on. Make them part of your weekly shopping trips. Make sure you always buy a little extra at the grocery store. Keep a prepping book with you to read while you are waiting in the car. Keep a bag of small skills you want to learn with you to do while waiting in the car. Like to knit or sew? Carry that with you and do it in your free time. Want to learn how to make different knots? Carry some small pieces of rope with you to practice. Plant some herbs and lettuce in a pot and place in a sunny spot in the window (remember to water!). Put together a first-aid kit for the vehicles and the house. Go for a hike with the family (or yourself) to get into better shape and relieve some stress. However, you can focus more time on prepping by practicing and using one word. Learn to say no. While I don't have a problem with kids being involved in activities, there comes a time when it is craziness personified. If your kids are in two sports at the same time while running to an art club, church youth group, and a few other activities all in one week, something needs to give. If two parents are each spending 3-4 hours every night running two or more kids to here, there, and everywhere, you need to start saying no to your kids and yourself. Stop signing them up for things. Carefully consider their requests to be apart of teams and clubs before saying yes. Ask them what they want to be in - their answers might surprise you. This saying no goes for you too. You are probably involved in more than you can handle too. By saying no, you are not depriving yourself of opportunities. By saying no, you are prioritizing what is important to you. Prepping is important and deserves a place in your priorities. You can't add hours to a day, but you can free up some time for what is important to you. We all can do that. We do it for family and friends. We do it for community, church, and school activities. We can do it for prepping too. Prepping is important and deserves a spot in your priorities too. When the ish hits the fan, you won't be ready. Your kids' activities will mean almost nothing in the scheme of things. You might be able to get by for 1-3 days with just what you have on hand. However, you might not have the right batteries or enough batteries for the flashlight and the radio. You might not have enough gas or charcoal for the grill or to heat up the food. The kids might have used the last bandaids and didn't tell you. You might be getting creative with meals really fast. You might have to evacuate and will not have the bags even packed or found. You don't know where all the important documents are. The medicines are not all in one place. There isn't enough water to pack to take with you. The vehicle is low on gas. The kids are restless without their activities and electronic gadgets and don't know what to do. This may sound extreme and crazy, but this has been the reality for a lot of unprepared people. I don't want to see you like that. I want you to have the confidence to handle the crisis because you took the time to be prepared. I don't want you running for help to one of the many inadequate help organizations and agencies. I want you to be ready for anything that can happen to you. Listen, I know life gets crazy and busy. We all have days like that. However, prepping is a priority that should never be put off until another day. You and your family deserve better than that.